Discover the 3 most beautiful islands in the world, Palawan, Boracay and Cebu. Swim in the turquoise waters of the beaches and lagoons of El Nido. Spend the day by the rice fields, going down the river on a Kayak and take a Kawa bath. The Philippines is undoubtedly one of the most beautiful countries in the world. It is no coincidence that 3 of its islands are always in the Top 5 of the most beautiful in the world according to the “Readers’ Choice Awards” of the renowned travel magazine Condé Nast Traveler. Endowed with a unique natural beauty, it is possible to find in the more than 7000 islands almost all types of landscapes. 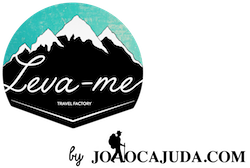 LEVA-ME by Joaocajuda.com will show you the beauty of this country that is still not very explored by tourism. We chose our four favorite islands to introduce you to the idyllic beach and lagoons of turquoise blue water, tropical jungle, rivers, waterfalls and rice plantations, its people … all in a 14 day itinerary that will be unforgettable. Pack your suitcase and get ready for a trip full of adventure! Arrival in Cebu. Transfer from the airport to the hotel (according to the schedule) We meet at the airport or in the hotel. After we check in we will have the rest of the day to enjoy the beach and recharge our batteries to be prepared for 14 days of adventure. We’ll wake up early. After having a nice breakfast at the hotel, We’ll grab our backpacks and be transfer to the port of Mactan, where we will board on a Ferry. 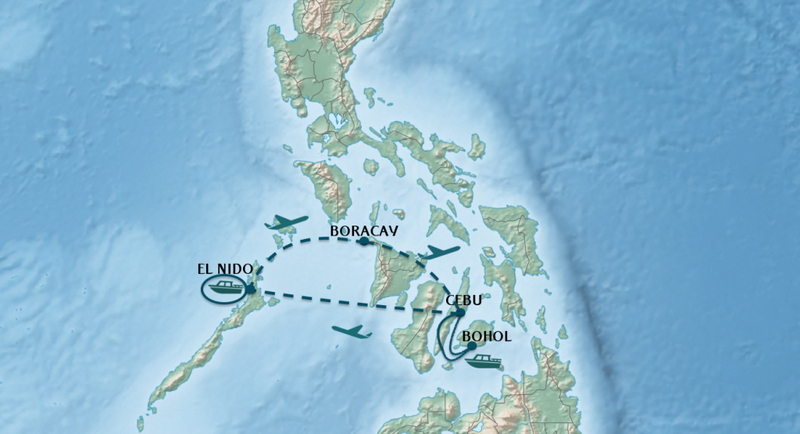 Today we will cross the sea to the island of Bohol, one of the most beautiful islands in the Philippines and where we will stay for the next few days. After arriving at Bohol port, transfer to our hotel, it’s time to check in and relax. Breakfast at the hotel. Free day to explore the region of the hotel or Extra Activity * – The Bohol Fields (not included). Blood Compact Site (Tagbilaram City): It was here that the Spanish and Filipinos stablished friendship through blood. Loboc River Cruise: Step aboard a boat and sail along one of the most beautiful rivers in the Philippines. The palm-fringed shores make these landscapes exotic by nature. You’ll have lunch, while sailing (Lunch included). Clarin’s Ancestral House (Loay): Visit a typical Bohol house, declared by the Institute of National History as a place of historical heritage. Man-Made Forest (Bilar): Go through this huge man-made forest that promises incredible photos. Chocolate Hills – It is not yet known the origins of these small mountains. There are more than 1200 that extend by tens of kilometers. They are known chocolate mountains because, in the dry season, they are brownish, unlike the dense forest that surrounds them. It is one of the most incredible places in the world. Breakfast at the hotel. Free day to enjoy the hotel and the beach. Those who want some adventure can rent a scooter and go explore the beaches of the region. After breakfast it’s time to pack and continue the trip. We’ll continue to Cebu via Ferry. Rest of the day is free at leisure to enjoy the swimming pool and beach. Extra Activity * Canyoneering along the Badian River and Kawasan waterfalls (not included). Get ready for one of the most incredible days of your life. Going down Badian River to the waterfalls of Kawasan is an incredible experience. No ropes are used, all you carry is a helmet and lifejacket. After a 5-minute walk through the forest, you plunge into one of the most beautiful rivers in the world. The tour lasts a few hours and you get to know “movie landscapes”. You will swim in the turquoise waters of the river, jump waterfalls, swim in ponds, go down natural slides and finish the adventure in one of the most beautiful places of the Philippines, the Kawasan falls. At the end, a barbecue will be ready on the beach (lunch included). The activity is almost all day, need 2/3 hours by bus (transfer) to go and 2 hours to come back to the hotel. Extra Activity: Swim with the whale sharks (not included). Have you ever dreamed of swimming with these ocean giants? Some are up to 20 meters in length and weigh 12 tons. The activity takes about 30 minutes. You’ll catch a canoe on the beach and move about 200 meters from the beach. Then just jump into the water and swim. Whale sharks are in the open sea. They are not aggressive and only feed on plankton. To do this activity you have to take into account some things: It is forbidden to touch the animals (under penalty of paying a fine or 6 months in prison) and you can not use sunscreen. Lunch included. The location of the activity is around 3 hours from the hotel. Transfer back to the hotel. Free night at leisure. After having breakfast at the hotel,we will go on a private transfer to Cebu airport, where we will catch a flight to the island of Palawan. After arriving to El Nido, transfer to the hotel. The rest of day is free. Today is the day to explore the pearls of El Nido. After breakfast at the hotel, we’ll go to our private boat for a day of Island hopping, snorkeling and many dives. We will visit some of the most beautiful islands of El Nido and get to know Shimizu island, 7th commando, Secret Lagoon, Small Lagoon, Big Lagoon, Secret beachm Hiddem Beach, etc … We will be able to see why Palawan is considered the most beautiful island in the world . Breakfast at the hotel. Free day to explore the shops, restaurants and bars of El Nido, rent a motorbike and visit the rice fields, the beaches of the area or just relax in the hotel’s swimming pool. After breakfast at the hotel, transfer to El Nido airport where we will catch a plane to Boracay. Upon arrival to Boracay transfer to the hotel. Breakfast at the hotel. Free day or Extra Activity * – Tibiao rice fields and Kawa bath (not included). Extra Activity – Visit to Tibiao rice fields, Kayak, Waterfalls and Kawa bath. Breakfast is taken early in the morning and the you’ll leave the hotel with the sun rising. You’ll take a boat to Caticlan and then a transfer to Culasi where you will visit the local market. Then continue to Tudo where you will have a continental breakfast while attending a cooking class of Gourmet dishes of the jungle. Get ready for the adrenaline going down the Kayak River. Arriving the destination you will have a wonderful tribal lunch waiting. To help digestion continue with a walk through rice fields, jungle, bamboo bridges and waterfalls where you can swim. To finish, nothing better and more original than a Kawa bath, in a huge “pot” with medicinal herbs and heated by firewood. Did you want a different day? Here you go! Transfer to Caticlan, boat to Boracay and transfer to hotel. (Lunch included). Breakfast at the hotel. Free day to get to know Boracay, the most famous island in the Philippines … Boracay is only 7 km long but there are many restaurants, markets, bars and beaches to get to know. Choose the best spot to lie down and sunbathe … coconut water? Massages? There is so much to do. Breakfast at the hotel. Time to enjoy the last waves on the magnificent white beach in Boracay. Pack your luggage, boat and bus transfer to Caticlan Airport, followed by flight to Cebu. Transfer to the hotel and the rest of the is day and night is free. Breakfast at the hotel and free morning. Check-out and transfer to Cebu / Mactan airport. Boarding o each traveler to its final destination. Airport fees for domestic flights in the Philippines. Every night in a 4 star hotel in a double or triple room with breakfast included. Crossings between the islands of Cebu – Bohol – Cebu by boat. All transfers and boats ensured between the different islands and regions as described in the itinerary. Meals not mentioned in the itinerary (+ – € 10 per meal) and drinks. Airport taxes. International flights: 700PHP (approximately 11€) Domestic flights: 200 PHP (approximately 3€). In order to make the trip more accessible to everyone, certain activities are not included in the tour price. Anyway they are pre-arranged, anyone who wants to do any of these activities can book from the the moment you join a tour. So on the days off, each person does what it wants: Stay on the beach, in the hotel pool, go walk around the city’s markets, visit temples or do these activities. You can also book these activities on the spot, but are dependent on available vacancies and prices at the time. (All extra activity prices are subject to change without notice). No, there are travelers coming from different parts of the world, so the group meeting point will be the hotel in Cebu. How do we meet in Cebu? We’ll take the data and flight schedules of all travelers. There is only one transfer from Cebu airport to the hotel. If you travel in another plane and arrive at the same time or before the majority of the group, you can wait at the airport and we will go all together in this transfer. If you arrive much later to Cebu, you have to go on your own to the hotel. It takes around 15 min from the airport to the Hotel. PEOPLE WITH PORTUGUESE AND BRAZILIAN PASSPORTS DO NOT NEED TO VISIT TO VISIT THE PHILIPPINES TO TOURISM. MAY REMAIN IN THE COUNTRY UNTIL 21 DAYS. Regarding Malaria, with the exception of Palawan, the areas we visit are not of concern,. However, you should be advised by the doctor. Show him the Itinerary and follow his directions. – Hepatitis B: Recommended for all travelers. – Typhoid fever: Recommended for all travelers wishing to eat foods (liquid or solid) other than in major hotels and restaurants. The Philippines is sometimes seen as a dangerous country for travelers. The Philippines consists of more than 7000 islands, some of them, as is the case of Mindanao in the southern region of the country are dangerous because of extremist group, but these are distant regions that we will not visit. All the islands that we are going to travel to, are island with some tourism and quiet. The people are generally very nice and kind. We never witnessed dangerous situations; on the contrary, we were always welcomed by charming people. Anyway have the usual care, there are pickpockets everywhere, whether in Portugal or in the Philippines.